Even before National City Lines management decimated most of Philadelphia's trolley system in the mid-1950s, PTC had drawn up plans to replace most of its trolleys with a combination of electric and gasoline-powered buses. A PTC planning document dated July 25, 1952 outlined a ten-year program that would replace the majority of Philadelphia's electric trolley lines with trolley buses (trackless trolleys) and a small fleet of gasoline powered buses. Note that the numbers do not add up to 48 because some lines are split up while others are combined. Please refer to table below. Details of the 1952 plan are intriguing. 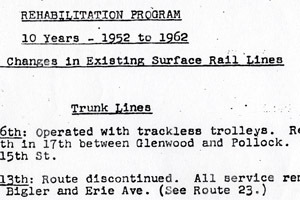 It's hard to understand why heavily travelled Route 15 Girard Avenue (which continues as an electric streetcar line today) was to be converted from trolley to trackless trolley. 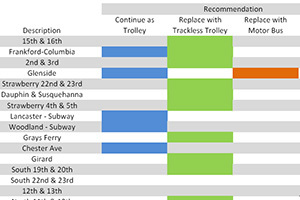 Conversely, Route 46, which utilized 1920s-era double-end trolleys on 58th and 60th Streets in West Philadelphia, was one of the few lines that was supposed to retain trolley service. Short Route 62 in Darby, which today sees trolley service as a rush-hour extension of Route 13, was supposed to be one of just six lines converted to motor bus. Ultimately, National City Lines plans for the system differed from this earlier plan mainly in that trolleys would be replaced not with trackless trolleys, but with diesel buses (built by General Motors, of course). The 1958 abandonment of the Route 6 suburban trolley through Glenside to Willow Grove was the last vandalism carried out by National City Lines. Things stabilized for a decade, with trolley abandonments resuming only after Southeastern Pennsylvania Transportation Authority (SEPTA) took over PTC in 1968. View the table in pdf format by following this link. Scans of the original four-page PTC document can be viewed by following this link.